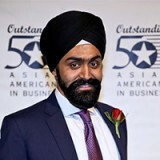 Savneet Singh founded Gold Bullion International, the first electronic platform that allows investors to buy, trade and store physical precious metals. Prior to founding GBI, Savneet was an investment analyst at Chilton Investment Company where he covered investments in the technology, alternative energy and infrastructure space. Savneet was a founding Board Member of ICAAD, served on the Board from 2012-2013, and as an Advisor through 2014. He received his B.S. in Applied Economics and Management from Cornell University and currently serves on the boards of Ecologic Solutions and Stiki Digital. Savneet was also named to the Forbes 30 under 30 list, in addition to the Empact 100 list of top 100 Entrepreneurs under 30.